Mommyville is a place mothers carry in themselves. 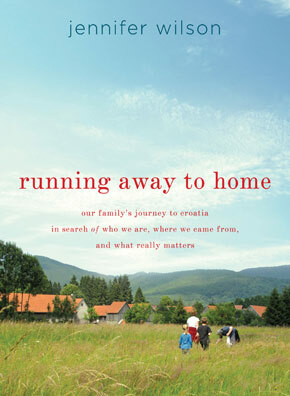 Everywhere you go there you are...In Jennifer Wilson’s new memoir—Running Away To Home, our family’s journey to Croatia in search of who we are, where we came from and what really matters—she captures perfectly the internal conflicts mothers face as they pursue their dreams with their families in tow. Wilson set out to write a travelogue and says she ended up becoming an accidental memoirist. Too personal and emotional for a standard travelogue, the internal process of taking one’s family on a year long adventure to find a lost heritage in a formerly war-torn country becomes an exploration in expanding the self and redefining what family means. I was fortunate enough to interview Wilson and felt sad that we didn’t live in the same town, since my instant desire was to go have coffee. In reading her book and even more so when speaking with her, one finds a kindred mommy spirit. It is easy to imagine quickly becoming her good friend, which is what reading her book is like. She tells a great story—but the level of personal detail about her fears, her hopes, her desires—it feels like she is hanging out sipping coffee right in front of you. The intimacy of her writing is compelling especially if one has ever dreamed of traveling and taking along children or if one is considering something completely crazy like making a significant life change. For me, what is so absorbing about the narrative is how the reality of motherhood in the United States is clearly articulated. It’s not always a fun place and Wilson acknowledges the isolation of the experience, but then in this bold move of changing her life for a year with her husband and her two kids, she sees what is real in her family and in America. The revelations Wilson discovers at times are unexpected, but also comforting. An overwhelming sense that life is “a glass half full” becomes a reminder that each of us individually—that I personally—have so much to be thankful for in these United States.